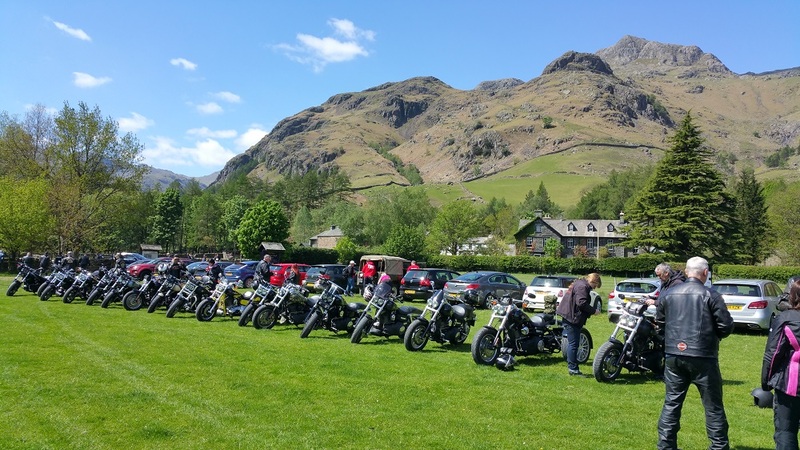 Derek and I recently arranged a Fat Bob ride-out in The Lakes on 14 May. Here’s our story, with some great pictures from the day (photo contributions from everyone). 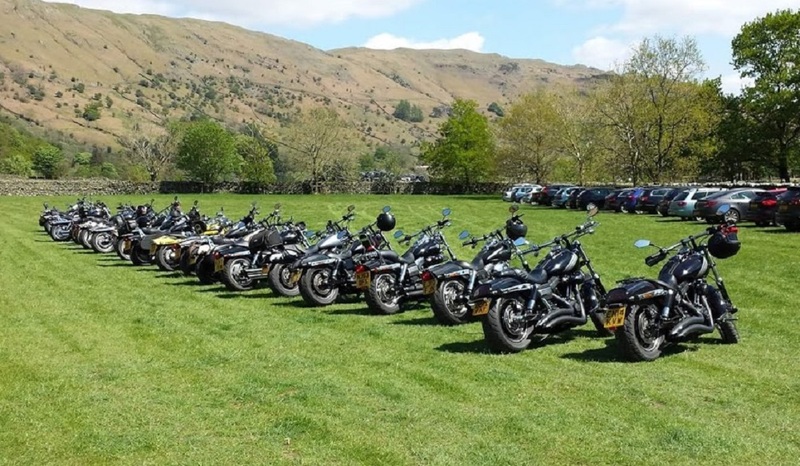 We had a fantastic ride-out on Saturday, and were blessed with beautiful dry sunny weather with blue skies – a perfect day for a perfect ride! 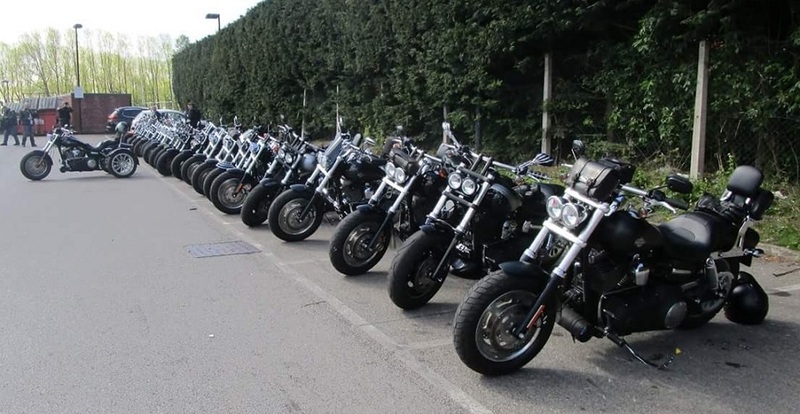 The idea of a Fat Bob only ride-out was suggested on a Facebook page called UK FatBobs (Harley-Davidson), and the idea quickly grew into reality, with so many enthusiastic riders wanting to be part of it. We’d seen how popular these rides are in Europe, particularly Belgium and Germany, and thought how amazing it would be to have one over here. 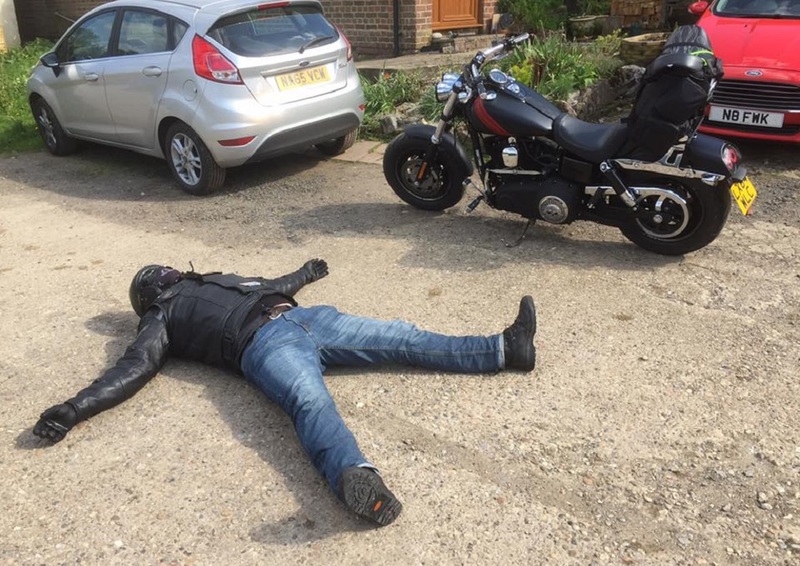 Having got it all off the ground, we reckon it’s the first ever Fat Bob only ride-out in the UK. There was a considerable amount of planning in getting it arranged, and we managed much of it with the help and enthusiasm of all those who were participating in the Facebook group. We had interest from all over the country, with some people travelling from Kent, London, Portsmouth, Merseyside and Lincoln. There was a real buzz in everyone’s reactions as many had either never been to the Lake District, or hadn’t been since they were much younger. 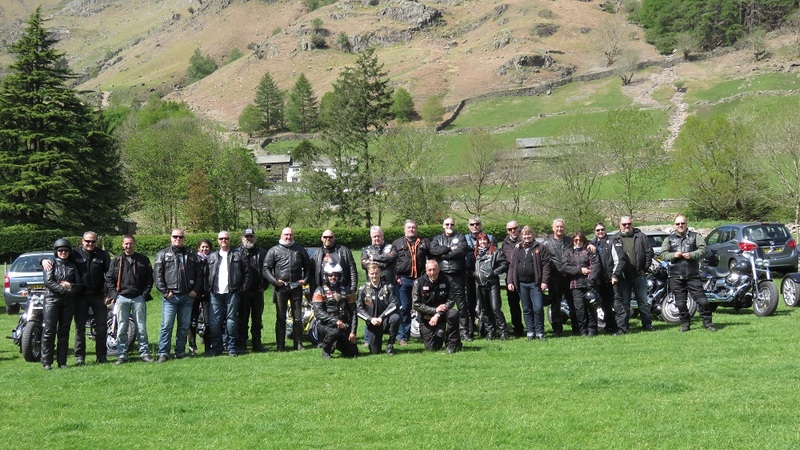 Like most good riding events, the day centred on the ride itself and Derek planned and led the route around the Lake District. On the day, we had twenty four Fat Bobs attend including a trike, with most travelling up on the Friday and staying through until Sunday. We helped everyone with local accommodation and booked up a local restaurant for an evening meal. Matty Ferguson (middle) – our new pin-up boy – sorry Brian! On Saturday, we left Penrith at 10.30am, heading towards Pooley Bridge then on to Glenridding and up Kirkstone Pass. We stopped at the Inn for a coffee and to take some photographs. The scenery is simply spectacular up there, just right for some great shots with our bikes and trike. With everyone fully refreshed, we then rode down The Struggle to Ambleside, taking the lakes road to Windermere and on through Coniston to Great Langdale. We stopped at the Walkers Bar, within the New Dungeon Ghyll Hotel, for a very welcome lunch. What we didn’t realise was that the hotel was also hosting a wedding, so their car park was full, and we ended up parked in a field at the front of the hotel. As it turned out, this provided a wonderful scenic backdrop of mountains. We were met by lots of cheering and waving by the wedding party and the bride and groom insisted on having several photographs taken with us! Our group was completely overwhelmed with the majestic scenery, and many underestimated how much they would enjoy the ride-out, the company and the region. After lunch, we set off again, riding through Ambleside then on to Keswick via the newly-opened A591. The road had been closed for many months, with much of it washed away by flooding. It was great to see it open again and it was a joy to ride, with exceptional new views across Thirlmere, with many of the trees cleared due to the floods. We ploughed on through Keswick and headed for Borrowdale before climbing the very steep Honister Pass to Honister Slate Mine, where we stopped for a coffee, more photographs and more smiles! All too soon, we were underway again heading for Buttermere and a brief stop for some lakeside photos. From there, we then followed the road to Braithwaite and picked up the A66, heading back to Penrith. 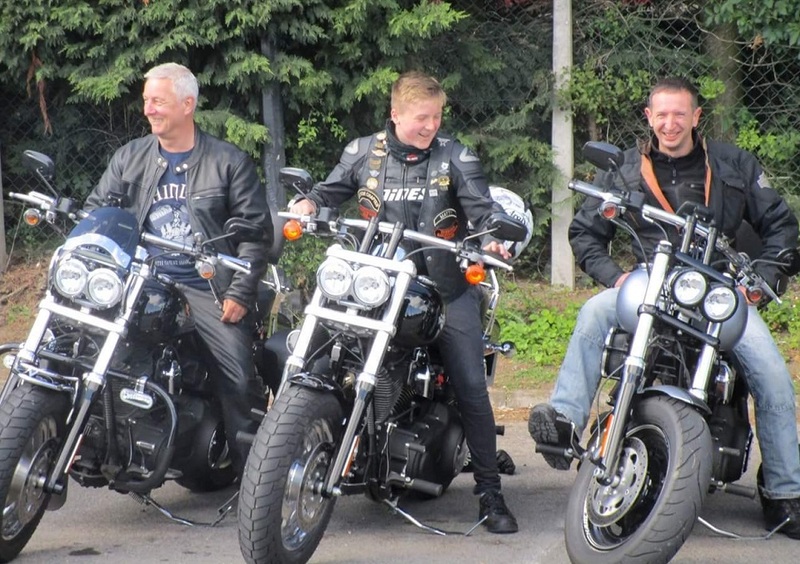 After riding 130 miles, we landed back about 5.00pm, with a collective groan – everyone was having such a great time and didn’t want the ride-out to end! We then arranged to meet up again for our evening meal and were met by lots of sunburnt, smiling faces. We had a lovely meal with our new found friends, topped off with a specially made cake in the shape of a Fat Bob tank. Everyone was gushing about how much they had enjoyed the weekend, with many promising to return to the Lake District very soon. We’ve already been asked to organise another one for next year. Plans are already afoot, with a date set for Saturday 27 May 2017. If any Fat Bob owners would like to attend, please go to the event page on Facebook Fat Bob Only Rideout Saturday 27 May 2017, and ask to join. Or click here.